At 1:00pm we began climbing from Nido de Condor Camp to reach the level of our Camp III, Berlin Camp. Today was more difficult than the climbing we had done up to this point. There was more ice and snow and steeper rock. Before we left, Jussi had a crampon class with Osvaldo and I, and we checked out his climbing gear. We started out climbing slowly, but for Jussi and this team 'slow' is never very slow. We actually reached Berlin Camp in only 1.5 hours and checked our GPS altimeter very carefully to make sure we had the altitude correct. Our high point today was 19,440ft/5,925m about 98ft/30m higher than Kilimanjaro where Jussi went with us last September. 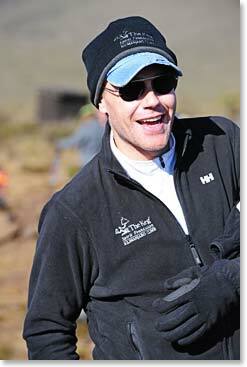 So Jussi set a new personal altitude record and he is performing very well as we climb higher on Aconcagua. Life is still good here around Nido de Condor. Yesterday morning before we left, Simon, our technician, our safe cracker, who is making the logistics of our expedition go so well, prepared pancakes. Jussi told us that it was appropriate on Saturday to eat pancakes because back in Vancouver, Jussi in his role as daddy makes Finnish pancakes for his daughters girls on weekends and it is always a treat. I am feeling really good about our decisions so far and about our acclimatization. 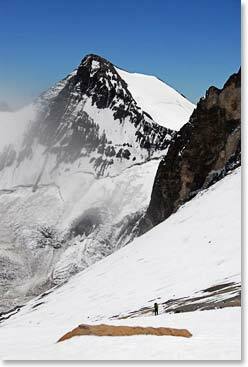 We are doing well with the altitude and we feel that we have a very good shot at reaching the summit of Aconcagua. We have decided that what we will stay true to our climb high, sleep low plan and we will stay here at Nido de Condor until we are acclimatized. Since Jussi can climb so fast, we have decided that we will attempt to reach the summit from this camp rather than staying at Berlin Camp. Right now, it looks like that will be on Monday. So stay tuned, we will keep sending you the news about life at 18,045ft/5,500m on Aconcagua.